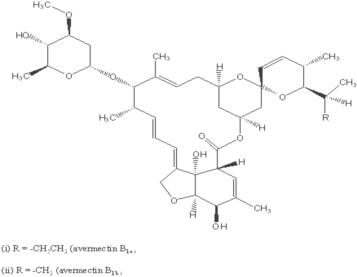 Introduction: Abamectin is a mixture of avermectins containing > 80% avermectin B1a and < 20% avermectin B1b. These two components, B1a and B1b have very similar biological and toxicological properties. The avermectins are insecticidal or anthelmintic compounds derived from the soil bacterium Streptomyces avermitilis. Abamectin is a natural fermentation product of this bacterium. Abamectin is used to control insect and mite pests of a range of agronomic, fruit, vegetable and ornamental crops, and it is used by homeowners for control of fire ants . Doses of 50 to 200 ��g/kg of ivermectin, a similar member of the avermectin family of comounds, is widely used to treat humans in the World Health Organization onchocerciasis (river blindness) program. Another name: Avermectin B1 and MK-936, Affirm, Agri-Mek, Avid, Dynamec, Vertimec and Zephyr. Liquid: 200L/Drum, 20L/Drum, 10L/Drum ect. Acute toxicity: 1) Acute oral LD50 for rats is 8.7 a.i. mg/kg. 2) Acute percutaneous LD50 for rats >2500 a.i. mg/kg. 3) Acute inhalation toxicity LC50(4h) for rats is 0.051 mg/L. 4) Skin irritation: Not an irritant (rabbits). 5)Eye irritation for rabbit: Non irritating. 6) Skin sensitization for guinea pig: not a sensitize. Other Not likely to be carcinogenic to humans , no evidence of a genotoxic or mutagenic potential. ADI (JMPR) 0.001 mg/kg b.w. . Effects on birds: Abamectin is practically nontoxic to birds. Acute oral LD50 for Bobwhite quail is >2000 a.i.mg/kg. There were no adverse effects on reproduction when mallard ducks were fed dietary doses of 3, 6, or 12 ppm for 18 weeks. Effects on aquatic organisms: Abamectin is highly toxic to fish and extremely toxic to aquatic invertebrates. The LC50 (96 h) is 0.0036 mg/L in rainbow trout, 0.0096 mg/L in bluegill sunfish, 0.015 mg/L in sheepshead minnows, 0.024 mg/L in channel catfish, and 0.042 mg/L in carp. The LC50 (48h) in Daphnia magna, a small freshwater crustacean, is 0.003 mg/L. The LC50 (96h) for is 0.0016 mg/L in pink shrimp, 430 mg/L in eastern oysters, and 153 mg/L in blue crab. Abamectin did not bioaccumulate in bluegill sunfish exposed to 0.099 ug/L for 28 days in a flow-through tank. The levels in fish were from 52 to 69 times the ambient water concentration, indicating that abamectin does not accumulate or persist in fish. Effects on bees: organisms: Abamectin is highly toxic to bees, with contact LC50(48h) is 0.002 ��g/bee and an oral LD50 of 0.009 ��g/bee. Effects on Algae: Acute EC50(72h), growth is > 1.59mg/L. Effects on earthworms: moderate toxicity to earthworms, Acute 14 day LC50 is 33 mg kg. Breakdown in soil and groundwater: Abamectin is rapidly degraded in soil. At the soil surface, it is subject to rapid photodegradation, with half-lives of 8 hours to 1 day reported. When applied to the soil surface and not shaded, its soil half-life is about 1 week. Under dark, aerobic conditions, the soil half-life was 2 weeks to 2 months . Loss of abamectin from soils is thought to be due to microbial degradation. The rate of degradation was significantly decreased under anaerobic conditions. Because abamectin is nearly insoluble in water and has a strong tendency to bind to soil particles, it is immobile in soil and unlikely to leach or contaminate groundwater. Compounds produced by the degradation of abamectin are also immobile and unlikely to contaminate groundwater. Breakdown in water: Abamectin is rapidly degraded in water. After initial distribution, its half-life in artificial pond water was 4 days. Its half-life in pond sediment was 2 to 4 weeks. It undergoes rapid photodegradation, with a half-life of 12 hours in water. When tested at pH levels common to surface and groundwater (pH 5, 7, and 9), abamectin did not hydrolyze. Breakdown in vegetation: Plants do not absorb abamectin from the soil. Abamectin is subject to rapid degradation when present as a thin film, as on treated leaf surfaces. Under laboratory conditions and in the presence of light, its half-life as a thin film was 4 to 6 hours. Usage: Abamectin is developed by Merck and Company (later Syngenta). Abamectin is a new effective broad-spectrum antibiotic insecticide and miticide, commonly used by the majority of farmers for agricultural production. Application: Abamectin is a broad spectrum insecticide with contact and stomach action on miticide, pests, mites, and it has seepage effect, but no ovicidal properties. Its insecticidal mechanism is to interfere with pests�� neurophysiological activity, mainly playing a role in nerve and muscle joints, increasing the release of chloride ions, which inhibit the transmission of information neuromuscular junction, causing insects or mites paralyzed, inactive, no feeding, dead after 2 ~ 4 days. Different from the mechanism of action of commonly used insecticides, it does not have cross-resistance to insecticides commonly used, suitable for prevention and treatment of pests resistant to organophosphate or pyrethroid insecticides. Abamectin degrades in soil and photolyse quickly; safe to crops; usually without phytotoxicity; mainly used to control caterpillars, cotton bollworms, diamondback moths, leafminers, spider mites and yellow tea, and for root-knot nematodes, worms and other soil pests leek as well. For the prevention and treatment of pieris, with 1.8% Abamectin EC in 2500~3000 times, evenly spray; for bollworm pest, with 1.8% clear avermectin EC, 0.75 ~ 1.5 g/667m2, watered spray; for dishes moth larvae or eggs in the young hatch peak, with a 1.8% avermectin EC in 2500~3000 times, evenly spray; for red spiders on cotton, fruit and vegetables, yellow tea mites, with 2.0% abamectin in 4500 times, evenly spray. According to the characteristics of pests and mites, decide whether the time of spraying is in the morning or evening, but avoid the heat of midday. For the control of vegetable root-knot nematodes, worms and other soil pests leek in breeding period, use 1 ml of 1.8% Ai Fuding EC per square meter of seedbed, spray after mixed with 1 kg water(diluted 1000 times); When planting, with 1.8% Ai Fuding EC at 1 ml/m2, spray the soil surface in 1000 times diluted.